Mommy's Kitchen - Recipes From my Texas Kitchen: Homemade Corn Dogs or is it Corny Dogs? Homemade Corn Dogs or is it Corny Dogs? 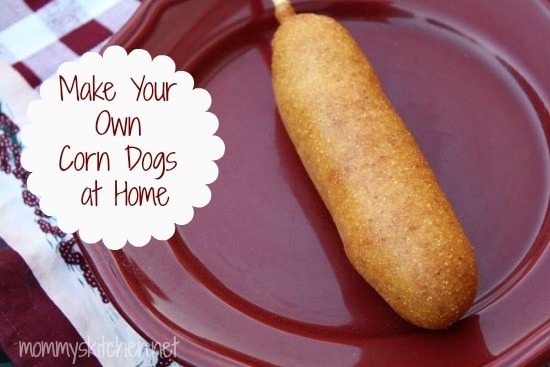 Skip the store-bought corn dogs and make your own with this simple recipe! When I think of corny dogs as my kids call them, I think of the State Fair of Texas. What is a visit to the fair without getting one of their wonderful corn dogs. When it comes to the fair it's all about the rides and games for the kids, but for me it's all about the yummy fair food you can only enjoy one time of the year. I have to say that some of the food you find at the fair is a bit far fetched for me, fried twinkies, fried banana splits, fried cake and even fried butter one year. None of these ever appeal to me and I tend to stick to the old fashioned favorites, turkey legs, sausage on a stick, corn dogs, funnel cakes and lemonade. Now that's fair food!!!! My youngest son, Carson loves the corn dogs at the fair and Canton Trade Days, so that's the first thing we have to hunt down when it is time to stop for lunch. Since he loves them so much I wanted to try and recreate his favorite fair food at home. I saw this recipe for Homemade Corn Dogs at The Hillbilly Housewife. I thought it would be neat to surprise my son with these homemade corny dogs, plus I wanted to see if they actually turned out. Can you believe I've never made homemade corn dogs because I always thought it was difficult and time consuming. You can imagine my excitement when the corn dogs were done and they turned out. I couldn't believe how simple it was, plus they taste so much better than the ones you buy at the store. The true test was Carson he's so picky, but no worries he gave our corn dogs a thumbs up and so did my daughter Mackenzie. Any leftover corn dogs store in the freezer nicely, so you can warm them up for another day. Just add them to a large zip lock bag. When ready to reheat just defrost in the microwave and then add them to the toaster oven. Do you make any homemade connivance foods at home? In a large bowl combine the buttermilk, eggs, oil, sugar and salt. Mix to combine. Sprinkle in the baking powder, corn meal and flour. Stir the mixture batter to make a slightly thick batter. Take your hot dogs out of the package and dry them off with paper towels. Dust the hot dogs with flour, coating them completely. The cornmeal batter won’t stick to the hot dogs unless they are coated in flour or the batter will slide off the slick hot dogs. Stick the Popsicle sticks into the flour coated hot dogs. Set the hot dogs aside on a plate. Heat up the oil in a large skillet or cast iron pan. You want the temperature to be about 375°. Allow the oil to preheat until it is almost smoking. Add the cornmeal batter o a quart size mason jar. Fill the jar about 3/4 of the way full. Dip one hot dog into the batter while you hold onto the stick. Swirl the hot dog to coat it evenly. Be careful or the batter will overflow. Raise the hot dog above the cup and let any excess batter drip off. Quickly place the battered dog into the hot oil.The fat (oil) will bubble up and cook the outside of the batter, making the corn dogs the exact same shape as the ones you buy at the store. Fry the corn dogs in batches a few at a time. If the corn dogs crowd each other they don’t coo well. I only fry 2 - 3 at a time. Turn the corn dogs when the bottom side is well browned. Use tongs to remove the cooked corn dogs from the oil. Allow the corn dogs to drain on paper towels. Repeat with the remaining hot dogs. Refill the mason jar with batter as needed. If you have any leftover batter it can be dropped by small spoonfuls into the hot oil and fried until brown. Serve these along side the corn dogs. To make mini corn dogs: Cut one hot dogs into thirds, or quarters. Poke a toothpick up into the end of the hot dogs. Coat and fry them using the same method as above. These little mini corn dogs are perfect for kids. Don't forget the ketchup and mustard for dipping. recipe yields: 10-12 corn dogs. I have always wanted to make these. I always bought the frozen ones at wal mart but no one eat them here so I need to make this, thanks for the recipe. I have to try this!!! I love corn dogs, but cannot stomach frozen store bought ones!! These look soo good! My mom used to make homemade corn dogs when I was growing up. I have the recipe and have made them several times over the years. This brings back fond memories! I'm with ya on the Fair Food - Funnel Cakes?? OH MY!!!! But, I LOVE LOVE homemade corn dogs!! Yours look perfect! Tina, I love corn dogs. Dip them in a mixture of ketchup and mustard and I get visions of fairs and carnivals in my head. How lovely. Thanks sweetie for the great recipe and show and tell. I would love to try this, but I have such a stupid question. What is hot fat? And the oil in the recipe, what kind of oil (vegetable, canola, etc)? Oh my gosh, you make this look so easy. Corn dogs are my favorite "fair" food! I never pass them up. I have got to try these! How fun, and they look so good and fairly easy to make. Glad the kids enjoyed them. Cat@3KidsandUs, What is hot fat? And the oil in the recipe, what kind of oil (vegetable, canola, etc)? For the oil it never stated int he original recipe, so I used vegetable oil. Hot Fat is just referring to the grease/oil you are frying the corn dogs in. Yum! We love corn dogs! I have never actually made them for the kids before, but you have inspired me. Thanks. I have to make these for ther grandkids!!!! THese look great and not that difficult. I'll have to give it a try. I like the idea of mini dogs too. Great for the kids. Ahh thank you! I will write that down. We will have this for dinner at our next movie night! Guess I'll have to buy oil for the deep fryer. I've been putting it off but I cannot deny my family of homemade corn dogs. I made these for my family tonight and they loved them!! I can't wait to make mini ones tomorrow with the left over batter. Thanks for a great idea and great recipe! Jennifer I am so glad you made them and liked them. Ü my son says they are better than the frozen ones. I added them again to my menu for next month, they are so fun to make. Umm Carm what a awesome addition. I am on my way to go check out your site and the post. Glad you liked them. It's nice to see someone else loves the Hillbilly Housewife! I had never thought to make my own before, but we had a house guest from France here for a month and he fell in love with corn dogs, but he can't get them there. So I started searching for a way for him to make them. Now I think it sounds like fun! I made these last night and they were perfect and yummy!!! PS. I sooo LOVE your blog anyways, keep up the good work!!! I don't eat hot dogs, but was thinking about another idea when I read your homemade refried beans recipe...what if I made little balls with a thicker mixture of refried beans and then put the corn coating on...not corny dogs, but maybe corny beanballs? I have cooked these 3 times in the last 4 weeks!... I LOVE THEM! & We are having them again tonight! I fry them in Canola Oil and it just gives them a wonderful flavor! MMMM! Thanks for sharing with us!! This is great! We are doing a "carnival night" and these corn dogs would be perfect. We were wondering how to fry them; we thought we'd have to do it with the dogs standing up but frying them like you did looks like it'll work out just fine! We are doing deep fried sat at my house for the family and we do wings and chicken fingers...I am making this recipe tonight with ball park all beef franks....I will post tomorrow and let yall know how they turn out!